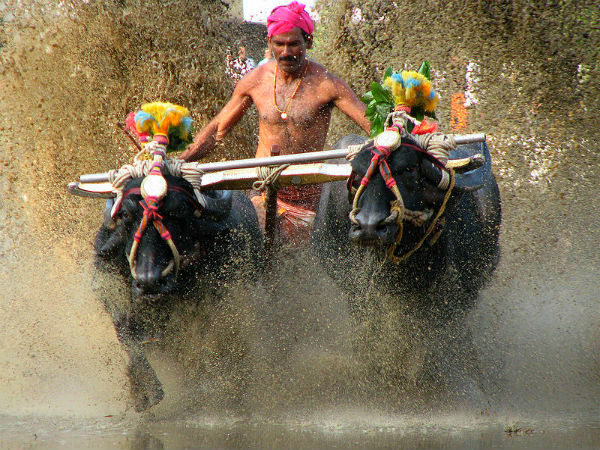 Kambala is a rural sporting festival, which is held in the coastal regions of Karnataka. The festival was a pastime for the royal family which ruled the area in the ancient times. There are many beliefs regarding the origin of the festival, one amongst them is that the festival was started by the Hoysala Kings to find out if the buffaloes could be trained and used during wars. The Hoysala kings were shocked to see the speed at which the buffaloes began racing against one another, which then developed into a sport for the royals. This tradition is still kept alive and passed on to the hands of the men by the feudal lords of the Tulu region. Another common belief is that the festival was founded by the farming community and is dedicated to Lord Kadri Manjunatha who is considered as an incarnation of Shiva. The festival was celebrated in order to please the gods for a good harvest. Earlier, the festival was known as Karaga, but later it came to be known as Kambala. The festival celebrated was of two types namely Bale Kambala and Pookere Kambala. The Bale Kambala has been discontinued around 900 years ago, whereas one can witness the Pookere Kambala every year. The festival is well known for its buffalo race which is held as a part of the celebrations. The two-day festival begins with an exhibition of the participating buffaloes along with their farmers. During the festival, the buffaloes are made to race on the tracks which are led by a farmer. Each team would comprise of two buffaloes and a rider who controls them. The two teams are made to race down two slushy tracks to find out the fastest team, and the winner is rewarded with coconuts and other things that can be used for daily purposes. The buffalo race takes place usually between the months of November and March every year at different places in Mangalore such as Puttur, Uppinagadi, Kamalakettu, Baradi Beedu, Bolantur, Kolatta and Majalu. The festival takes place amongst a crowd of enthusiastic onlookers and supporters, which transforms the atmosphere into an electric one with large amounts of anticipation and excitement during the races. As the farmer edges his buffaloes to the race on the track and reaches the finishing line first, the crowds cheer him up. The farmer whose buffaloes cover the distance at the shortest duration is declared the winner. These races continue overnight, with different types of races being held at different level which would qualify for the grand finale. The grand finale generally is held in the afternoon of the second day. The fastest pair of buffaloes are declared as winners of the race and the farmer is rewarded. The festival takes place in various categories, and the four main categories are Negilu, Hagga, Adda Halage and Kene Halage. Negilu is the category where, while racing, the farmer holds onto a plough which is tied onto the buffaloes. The plough used in the race is a light wooden replica of the plough used on the fields. This category is led at the entry level, or for the buffaloes who generally do not have any prior experience. Hagga is the next category where the buffaloes have a rope tied onto them. This category is for the buffaloes who are well experienced in taking part in the race. The buffaloes who fall into this category have more speed than the ones in the first category. In the Adda Halage category, the buffaloes will have to race with a wooden plank tied on to them, on which the farmer would stand as the buffaloes race towards the finishing point. This category is mainly meant for the senior buffaloes who have prior experience. The last category is the Kene Halage, in which the farmer stands on top of a round-shaped block on a single leg. The wooden block has two holes through it which would send water gushing out while running. The Kambala festival is scheduled to happen this year on August 19th.